If you are selling products and other goods online, then the best way to market your business is by using an ecommerce site. Unlike other website structures, ecommerce sites are designed specifically to promote items in a sellable fashion, and not just the typical post type normally seen in blogs and website pages. Ecommerce websites are a bit more difficult to build and set up, thus you have only have two options: you either hire specific web design services to build an ecommerce site, or use software builder instead. The latter is actually more cost-effective; you need not pay for manpower service, but rather purchase a software solution that you can use repeatedly in case you find the need to build new sites. There are many ecommerce site software builders these days, and if you’re looking for a dependable kind, you can check out 3DCart.com. 3DCart.com is among the newest website building software packages used to construct ecommerce sites. It is composed of tools that customers can use in building their ecommerce sites based on their needs and preferences. •	Website builder. The core tool that customers will be using in 3DCart.com is its drag-and-drop website builder. This makes website building easier, as the tasks can be handled without the tedious editing of codes. Entrepreneurs who are not trained web designers are still capable of building their websites using the tools offered by the software. On the other hand, developers can do their own manual design edits using HTML and CSS. 3DCart also offers an exclusive Quick Edit Bar that allows users to make design changes on a real time basis. This tool also speeds up the process of adding and changing categories, uploading product images and web pages. •	3DZoom. 3DCart also allows users to build beautiful site image galleries using its 3DZoom tool, which offers auto-zoom and enlargement options and an automatic thumbnail maker. With this tool, site visitors are able to view product images and appreciate them right away. •	Promotion and marketing. 3DCart also makes use of search engine friendly HTML URLs for SEO and SEM strategies, meta tags for product pages, category Breadcrumb navigation, and search engine optimized catalog, as well as product reviews, ROI tracking, and onsite promotions. •	Mini. At $19.99, this package can cater up to 100 products and has very low traffic. •	Starter. At $35.99, this package has up to 4GB traffic and free domain registration. •	Professional. This package costs $65.99 per month, has 8GB traffic, and caters up to 1,000 products. It also has a live chat plugin in addition to free domain registration. •	Professional +. At $99.99, this package has high traffic of 25GB, caters up to 5,000 products, includes a 3DCart Guru, live chat and quickbooks plugins, and free domain registration. •	Power plan. This plan meanwhile costs $129.99 and has very high traffic, can serve unlimited number of products, and many other perks. All packages offer premium phone support, mobile/social commerce integration, unlimited HD storage for image, and free setup. If there’s one thing that you will notice in 3DCart.com, that would be the software not containing a built-in POS system. You may have to look for a third-party tool to set that up, which can be a hassle especially for non-developer users. However, this issue can be easily fixed with a little help from a website designer. 3DCart.com is known for its superb customer service, which promotes transparency and accountability to its clients almost all the time. The culture of transparency established by this service is what makes it more valuable compared to other more popular ecommerce site builders, as clients are properly kept in the loop about their accounts and inquiries. 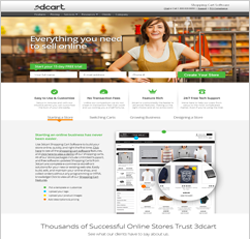 3DCart.com is one great ecommerce site building software, as it provides almost everything an online entrepreneur needs to establish his store on the internet. Its packages are also more affordable than its competitors, and clients may choose a package that specifically meets their needs. What makes 3DCart.com extra special is that it has more powerful tools for SEO, social media, and mobile integration. With these integration tools at hand, users find it easier to tap audiences in these networks and communities, which in turn result to bigger ROI.